Step 1 Place beef in large stockpot filled with cold water and bring to boil. Reduce heat and simmer until very tender, about 2 1/2 hours. Remove meat, set aside to cool and reserve broth. Step 2 In a separate pot, boil peppers and garlic 1 1/2 hours. Remove from pot and reserve water. Remove stem and seeds from peppers and place peppers and garlic in a blender or food processor. Add small amount of broth from beef and blend to mix well. Step 3Pour contents of blender into medium stockpot and add flour slowly to ensure it mixes thoroughly. Add remaining beef broth and pepper cooking water until stockpot is filled three-fourths full, about 3 1/2 to 4 cups. Season with salt. Cook over low heat, stirring constantly, until flour is blended in thoroughly, about 5 minutes. Continue cooking until broth is slightly thickened, about 45 minutes. Step 4Shred beef, add to chile sauce and set aside. Step 5Soak husks in sink filled with warm water 15 minutes. Remove and pat dry. Stack them in a pile. Step 6For each tamale, take a spoonful of masa and spread on corn husk, making sure tapered end of husk points down and that there is room all around husk to allow for wrapping. Add about 3 tablespoons of mole to center of tamale. Fold in each side of husk, then fold up from the bottom. Set aside. Repeat to make rest of tamales. 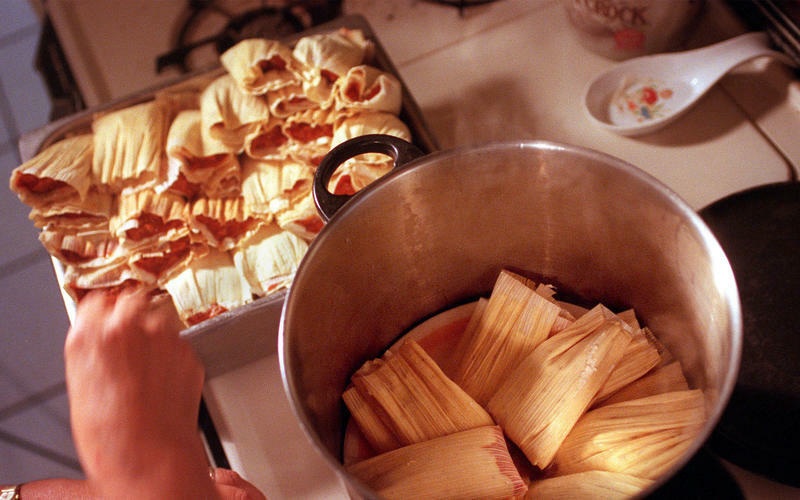 Step 7When tamales are all formed, place in batches in steamer set over simmering water. Steam until masa is firm, about 1 1/2 hours. In Recipes-list.com we have selected the most viewed recipes from category - Main courses . Enjoy the best recipes specially selected for you! Beef and mole tamales (Tamales de res y mole) is the right choice that will satisfy all your claims.